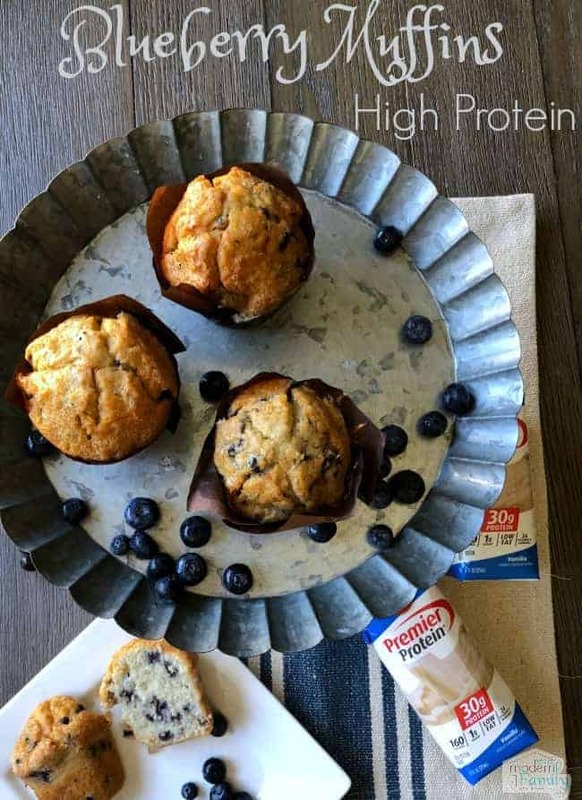 This recipe for High Protein Blueberry Muffins is one of our favorites. 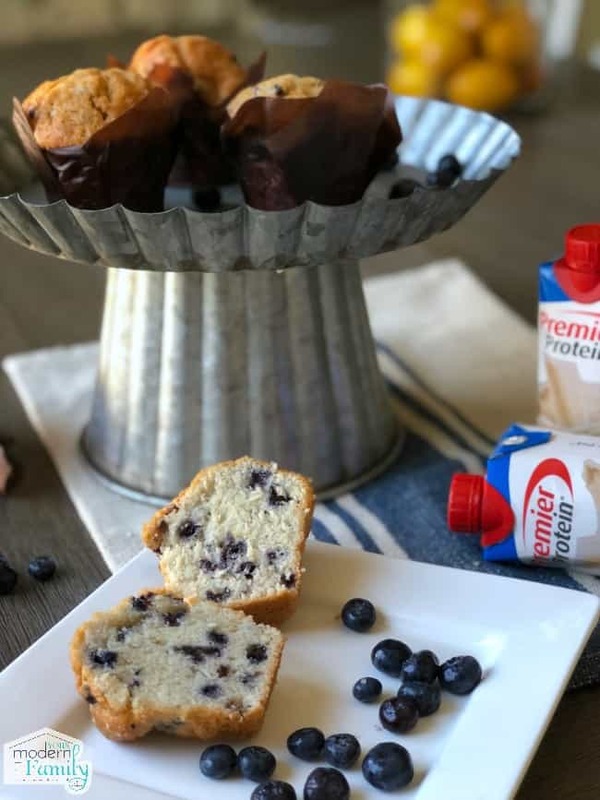 I always hear great things from friends after they make our High Protein Peanut Butter Banana Muffins, so today we wanted to share our high protein blueberry muffins! 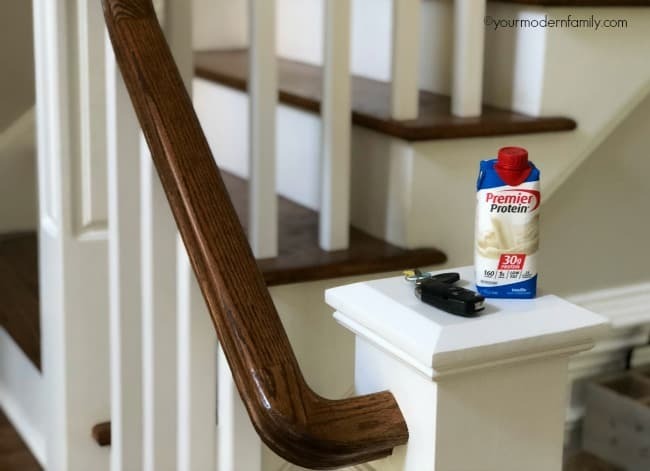 Thanks to Premier Protein for sponsoring this post. My husband loves Premier Protein shakes. We’ve had the Chocolate, Vanilla, Strawberries & Cream, Bananas & Cream, Caramel, Peaches & Cream, and Cookies & Cream in our house… and we’ve like every one of them. We grab one most mornings when we are running out the door to take the kids to school – it’s convenient, filling & has 30 grams of protein, so it keeps us full. We constantly have them in our house, so I wanted to think of a way to use them in recipes that we love for added protein. Since Premier Protein shakes’ new Earth First packaging features FSC®-certified Tetra Pak cartons and a re-sealable plant-based cap derived from sugarcane, I feel good about buying them and using them. Premier Protein’s Tetra Pak light-weight cartons are recyclable and FSC®-certified (the materials have been responsibly sourced. I love how the carton is made from mostly paper that comes from forests that are sustainably managed (meaning they can continue to grow). I have really tried hard to teach our kids that we need to take care of the earth, and one of the best ways to teach anything is by example. Our kids have seen me recycle for years and they have been doing the same. I used Premier Protein shakes’ with the Earth First packaging to talk about how the paper fiber contained in Premier Protein’s Tetra Pak cartons can be re-used to make new products, including tissues, benches and coloring books. Even the plant-based sugarcane cap is durable, protective, 100% recyclable and GMO-free. With Premier Protein putting such a focus on the health of the planet, I try to do the same… put a focus on the health of our planet and the health of our children. 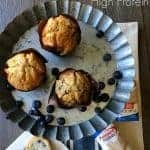 These Blueberry Muffins are not only tasty but also high in protein for our family. Everyone loves them. We love this blueberry muffin recipe because it makes about 8 big muffins or 10-12 regular sized muffins. Preheat oven to 400 degrees. While it is preheating, line your muffin pan with muffin liners. I spray them, too. To make the batter, you will whisk together: Flour, baking powder, sugar, and salt. Next, you will add the oil, egg, vanilla, and the Premier Protein shake. Stir until combined well, but not over-mixed. NOTE: IF the flour looks runny, add a Tablespoon of flour to thicken it up a bit. Optional: Sprinkle a pinch of sugar on top of each muffin. Bake at 400 degrees for about 15-18 minutes, until you can insert a toothpick and it comes out with dry crumbs (not batter). NOTE: If you use frozen blueberries, do not thaw them. Put them into a bag with 1/4 cup flour, close the bag and shake to coat the berries. Use the flour-covered berries immediately. 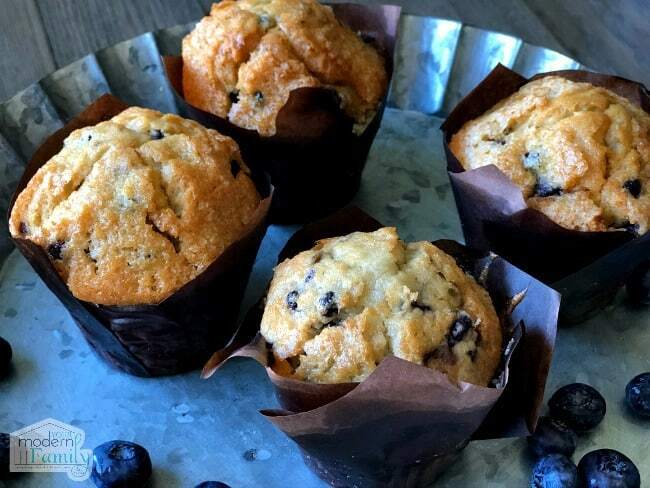 This recipe only takes about 30 minutes total (10 to prep & 20 to cook) We love this blueberry muffin recipe because it makes about 8 big muffins or 10-12 regular sized muffins. Combine Dry Ingredients: Whisk together: Flour, baking powder, sugar, and salt. Combine Wet Ingredients: Add the oil, egg, vanilla, and the Premier Protein shake. Stir until combined well, but not over-mixed. 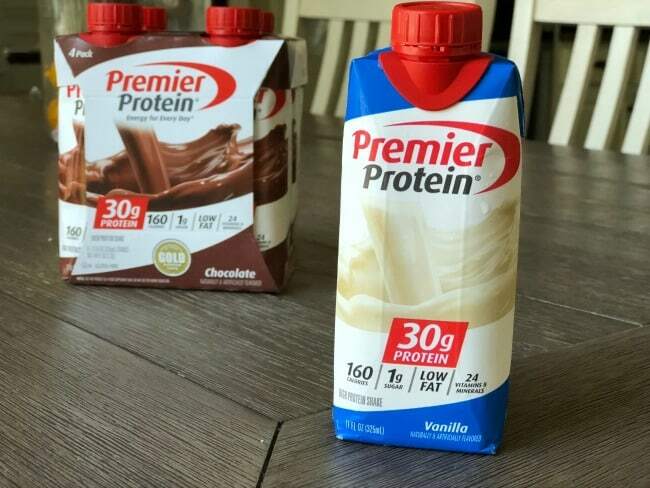 For more information on Premier Protein shakes, including where to purchase, visit PremierProtein or @PremierProtein on Facebook, Twitter and Instagram.